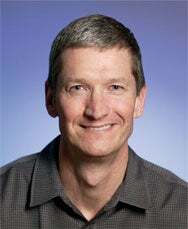 Apple may have revealed additional details about the iPad on Friday, but perhaps a more interesting revelation came in the form of regulatory filing regarding Apple Chief Operating Officer Tim Cook. You may recall that CEO Steve Jobs took a six-month leave of absence in 2009 due to medical issues, and that Cook ran the day-to-day operations of Apple during that time. Apparently, Apple’s board of directors remembers that time as well. The Wall Street Journal reports (subscription required) that Friday’s filing shows Cook was awarded a bonus package worth $22 million—which comes out to $3.6 million a month while filling in for Jobs. According to the story, the bonus comprised $5 million in cash, and 75,000 restricted stock units (half of which vest on March 10, 2011, half on March 10, 2012) worth about $17 million as of today. Jobs is said to have nominated Cook for the bonus himself. Clearly, the board took that nomination pretty seriously.